BANGKOK, Thailand, September 26, 2011 (ENS) – Thailand’s rivers are being increasingly polluted by industrial wastewater and solid waste dumping, but activists and residents say the Thai government has no clear strategy for water pollution prevention. In the past, Thais have not been exposed to much industrial pollution in rivers, and many did not pay attention to preserving and recycling water because shortages were uncommon. Thailand has been fortunate to have an abundant supply of fresh water, but clean water advocates say the time for complacency is over. 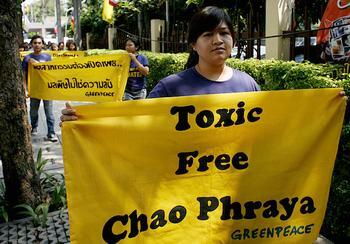 A January 2011 Greenpeace report, “Hidden Consequences,” drew attention to the 30,000 industrial facilities along the Chao-Phraya River, which runs through Thailand’s major cities, including the capital, Bangkok, a city of 12 million people. Two months later, an ABAC public opinion poll surveyed 1,550 Thai residents living in three major industrial districts, and found that 74 percent were worried about toxic chemical contamination in their waterways. A critical test of pollution is the analysis of dissolved oxygen. The Pollution Control Department of Thailand reported a level in August 2010 of one milligram per liter in the lower part of the Chao Phraya, which compares to a normal range of between three and six mg/l. Samrong Canal is located in Samutprakan province south of the Bangkok Metropolitan Region, notorious for being one of the most polluted residential waterways in Thailand. 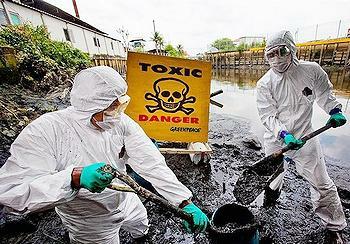 The canal is used to dump waste by a variety of metal plating, chemical, plastics and textile dyeing factories. It has a very low dissolved oxygen content, combined with the presence of hazardous substances such as heavy metals, nonylphenols, and the carcinogen 2-naphthylamine. While the main concern is wastewater released from factories, untreated sewage from residential areas is another problem. This effluent may not be as worrying to residents as industrial pollutants but the risk should not be underestimated, as it is a carrier of many diseases including typhoid. According to a World Health Organization report, diarrhea caused by this type of contaminated water causes 2.2 million deaths each year worldwide. Improper residential solid refuse disposal is another factor that can degrade the condition of river water. “Every week local refuse collectors would collect household rubbish but most of the bins were not full because people just dumped the bagged domestic waste straight into the canal,” says Siripojjanawan. Regulations for waste contamination and treatment for industry, issued back in 1992, have not been effective, and some residents have complained about these industrial polluters, requesting the authorities protect their neighborhoods. But many residents have found it hard to get assistance from any level of government. 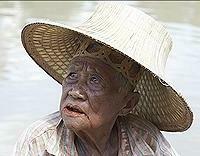 Lertsak Phoonphon, 37, owns a shrimp farm that has been endangered by the toxic waste draining from a nearby landfill. He filed a complaint against the tire company that owns the land 12 months ago but, even though the local authority informed him that they will take care of the problem, he has not heard anything since. Some talks have been arranged by activists and Thai officials to come up with a strategy for water pollution in Thailand. It is led by Hannarong Yaowalert, president of the Foundation for Integrated Water Management, who argues that all stakeholders need to work together to solve the water problem. “We don’t have laws that are being seriously enforced, and until the government does this and also introduces better laws, it may not deliver results, because residents living nearby those industrial units don’t know exactly what is in the water. Factories must take responsibility for the chemicals they release,” said Yaowalert. As the same time, Greenpeace representative Ply Pirom, who has contributed to several hazardous waste dumping and water pollution projects in Thailand, has been working with residents in industrial neighborhoods. “In general, it seems there has been no improvement in the pollution control measures for decades, and the Pollution Control Department only monitors the water with few basic parameters,” Pirom explained. Greenpeace has been campaigning to raise awareness and to ban the use and release of hazardous chemicals into the environment. “First they should rather look into the chemicals used and released by the factories. Then, they should make the factories become more transparent. This can be done by having laws such as a Pollutant Release and Transfer Register, or PRTR,” says Greenpeace. 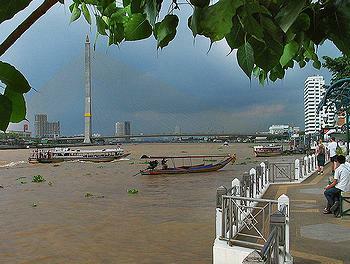 All of this raises questions for many riverside residents and the Thai people as a whole. Will they ever know exactly what is in their water? How can they become aware of the pollutants being released from factories? Now can they protect themselves from using contaminated supplies in their everyday lives? As population and urban density rises across Thailand, it will place a greater and greater strain on water supplies, and the need for good planning and robust policies concerning supply management, pollution and recycling will become increasingly important. The Blue Planet Network estimates that 5.3 billion people, about two-thirds of the world’s population, will suffer from water shortages by 2025, and that water is already a $400 billion dollar global industry; the third largest behind electricity and oil. Clean water advocates say Thailand must be thoughtful about its water policy, both for the security of its own people and its neighbors and for the planet as a whole.